Does he rub his face on the floor, have dry and flaky skin, get hot spots, and even get rashes that become infected? One of my dogs does! Meet Ender. He’s the sweet black lab/great dane mix staring at you through your screen. Here’s how we discovered what his allergies are, how we did our own dog food allergy test, and how we fixed it — without medicine! 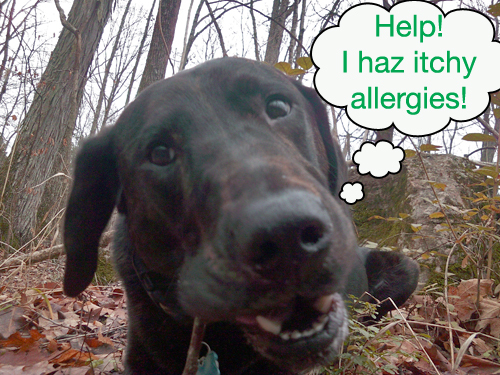 What’s the most common cause of allergies in dogs? The answer seems to remain unclear, unfortunately. Ask one vet, and they will say food allergies. While another vet will say that it is inhaled allergies. Here are the top 4 dog allergies, as well as dog allergy symptoms & treatments you should know about. For Ender, (we think) we discovered that he has mostly food allergies — with a little bit of inhaled allergies, as well. The good news is, he suffers no more! One day this past summer (about a year after rescuing our 2 pups) we noticed our male dog, Ender, had some splotchy spots on his stomach. Being that we live in an area that makes everyone suffer from allergies, we didn’t think much of it. Until 2 days later when the rash exploded into a full blown skin infection! When I took him to the vet, I was informed that he was suffering from allergies. His allergies had also been contributing to chronic ear infections that he had been dealing with since we rescued him, but the vet hadn’t made the connection yet. You see, in dogs (just like humans) the ears are just an extension of the skin — so recurring ear infections could actually be due to allergies, not poor ear hygiene. What Foods Are Dogs Allergic To? Even though food allergies may or may not be the most common cause of allergies in dogs, it’s one of the easier ones to diagnose. If you take your pup to the vet and mention that you suspect dog food allergies, the vet will prescribe a dog allergy food trial. It’s like $50 per 15-pound bag of food. And you’re supposed to do the dog food trial for at least 8 weeks — usually for 3 months. If your dog is a bigger breed like mine, that will nearly break the bank! The main thing you need for a do-it-yourself dog allergy food trial is to choose a dog food with a SINGLE, alternative protein source. Ender has been eating the Fish & Sweet Potato food from Blue Buffalo. Fish is known to be beneficial for skin health (in both dogs and humans) — so it seemed to clearly be the best choice. The carbohydrate source is Sweet Potato (instead of Brown Rice) — this eliminates the possibility of continued problems, in case Ender is also allergic to Rice Gluten. TIP: If the ingredient list on your dog’s food shows Chicken Fat as an ingredient and Chicken is a big part of the allergen problem for your dog, then the presence of Chicken Fat may be enough for the problem to continue. Flaxseed would be a much better source of Omega-3’s and Linoleic Acid than Chicken Fat. Speaking of Flaxseed, a skin supplement like Dinovite may be a great addition to your dog’s diet, as well. Be Leary Of Dog Treats! Many “allergen free” dog treats have large amounts of Chicken Fat and/or Chicken Meal in them. Fortunately, there are several brands of dog treats that are Fish-based and contain NO Wheat, Gluten, and other allergens — including Corn (which has zero nutritional value for dogs or humans). Whatever food you try, stick to the dog food trial for 3 months — because it can take that long for a dog’s body to adjust to the new diet. What tips and tricks do you have for relieving dog food allergies? For the record, my dog Ender now eats Nature’s Select dog food — which is much better for dog food allergies!